St. Patrick's Day is the perfect day to practice coin counting and recognition. After all, Leprechauns love their coins and hidden pots of gold! My daughter has learned the values of the U.S. coins and can identify each of the coins by name. I thought that we might try to advance her skills by creating a Pot of Gold game that combined basic addition, counting, making change and coin values. At this point, she still needs my help to make her change, but I think that older kids in early elementary school will be able to play this game without assistance. 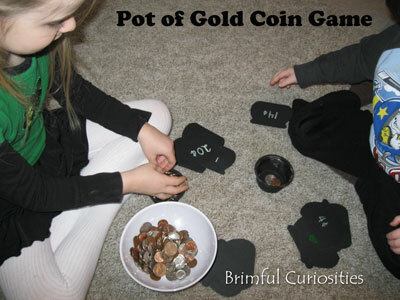 Use your coin identification and counting skills to fill up your pot with shiny pennies and other coins in this fun St. Patrick’s Day game. Watch out for the sneaky leprechaun’s shamrock cards! Prep and Set-up: Print the pot-shaped template at 50% size (change size in print preview) from www.allkidsnetwork.com, trace 25 pot-shaped cards onto black paper. Cut out the pots. Using a white crayon, label each of the 25 cards with money values starting with 1¢, 2¢, 3¢, etc. and ending with 25¢. Draw a shamrock shape on the 1¢, 5¢, 10¢ and 25¢ cards. Object: The player that ends up with the most pennies in their pot (bowl) wins the game. Game Play: Shuffle the pot-shaped cards and place the deck face down. This is the draw pile. Place the jar of coins next to the draw pile. Determine which player goes first. The first player draws the top card from the draw pile. The player reads off the money value of the card and counts out the same amount of money from the jar and places it in their bowl. They place the card next to their bowl. The player must use the least amount of coins possible when making change from the jar (i.e. : if the player draws the 19¢ card, they must take a dime, a nickel and four pennies, not nineteen pennies). The next player takes the top card from the draw pile counts their change. Watch out for the leprechaun’s shamrocks! The leprechaun wants to steal your coins! If one of the players draws a card with a shamrock (1¢, 5¢, 10¢ and 25¢ cards) the player must dump all the coins from their bowl back into the jar. However, the leprechaun isn’t entirely greedy. In exchange for the pot of gold, the player may take the coin indicated on their card and place the single coin in their bowl. Ending the Game: Play ends when all cards are gone from the draw pile. The players count the pennies in their bowls. The player with the most pennies (gold) wins the game. To adapt this game for preschool and early kindergarten ages, make and label the 25 pot-shaped cards as follows: four 5¢ cards, four 10¢ cards, four 25¢ cards, eleven 1¢ cards, and draw a shamrock on the two remaining cards. Each player takes turns drawing a card, finding the corresponding coin from the coin jar and placing it in their bowl. If a player draws a shamrock, the player must empty the contents of their bowl back into the coin jar (the leprechaun steals their coins). The game ends when all the cards are gone from the draw pile. The player with the most pennies is the winner. I've been enjoying reading your blog since you left a comment on mine! Our kids are the same age, and I LOVE children's books too! Saving the idea from this post for St. Patty's Day next year!